Don’t trust the release notes. 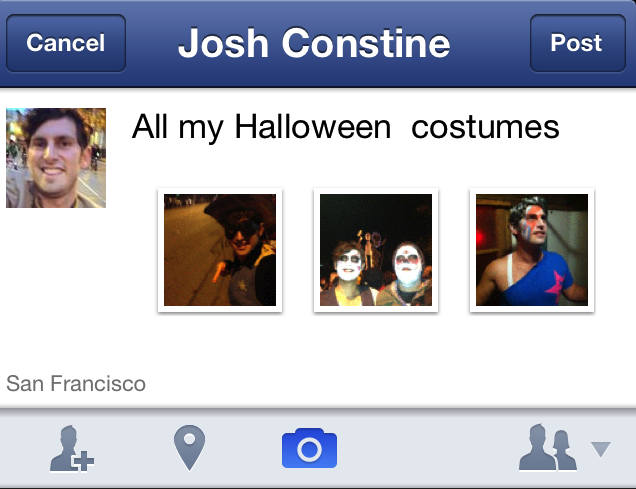 Facebook has just added photo filters to its iOS app, though the feature wasn’t announced in the version 5.1 “What’s New” that highlights multi-photo uploads, slide-out chat buddy list, and Gift giving. Here’s a look at the new features in v5.1 and what I think will be added in the next release. Facebook Camera launched in May, giving the social network’s users a way to natively filter their photos for the first time. Now Facebook has embedded all the functionality of Camera in its primary iOS app, including filters like “Contrast”, “Copper”, “Cream” and “B+W”. You can add them by tapping the ‘magic wand’ once you’ve chosen a photo to post. The ‘borders’ icon meanwhile lets you crop a photo. Other than offering a way to browse a photos-only news feed, version 5.1 of Facebook for iOS basically eliminates the need for Facebook Camera. The addition of the the filters comes just days after the New York Times leaked the news that Twitter plans to add photo filtering to its apps soon. That means when Twitter eventually launches the feature, it will seem late to the party. And I’ve heard Twitter is pissed and on the hunt for whoever let the news slip. While it’s not as high-profile as filters, multi-photo uploading is by far my favorite feature of any photography app. It’s why I’ve been using Facebook Camera rather than Path, Twitter, or even Instagram. By sharing several photos at once, you can tell a story. Take a photo of the landscape where you are, a portrait of who you’re with, and a close-up of what you’re doing, then share them all at once right from the primary Facebook app. With both filters and multi-shot uploads, those who predominantly used Instagram to cross-post to Facebook might skip the photo-only social network and just go with Facebook for iOS. What’s Next? Facebook may look to add a light correction button similar to the Instagram “Lux” button that cools down over-saturation and adds brightness to shadowy areas. Facebook launched the Gifts beta in the U.S. at the end of September. iOS users could unwrap Gifts they received, but only Android and web users could actually buy and send them. Now iOS users can buy Gifts, too, through the composer on friends’ walls, which means Facebook could start making more money on mobile. iOS users may also see stories about each day’s birthdays and options to buy those people Gifts at the top of the news feed. What’s next? A dedicated Gifts section of the app available from the navigation menu. This might show the day’s birthdays, engagements, marriages, plus other people celebrating, and let you buy them Gifts. Facebook for iOS has had a Chat buddy list…it’s just been buried in the navigation menu under the Apps section that otherwise houses third-party products. Most people probably didn’t even know it was there, and opening it was a pain. Now you can swipe left at any time to see which friends are online on the web or available for Chat via mobile. The app automatically puts the people you Chat with most in a section at the top of your buddy list. You can also edit a Favorites category atop the buddy list to quickly check if your most beloved homies are online. Beneath Favorites you’ll see a list of the rest of your available friends. Sure it avoids redundancy, but I find it annoying that people in my Favorites don’t also show up in the full list. That means you have to check both if you forget who’s a Favorite. What’s next? Messages search and better access to your Other inbox. Facebook recently redesigned the web version of Messages to make it more like a full-fledged email client, and I expect the bigger focus on search to be ported to mobile. Facebook might also make it easier to check your Other inbox where it hides messages from people who are friends or friends of friends. And after that? The next really big thing from Facebook in mobile is likely to be the speed update to its Android app. Facebook cut load times in half for its iOS app in August by ditching HTML5 in favor of a more native architecture. It said the Android speed update was on the way, and at this point it’s well overdue. Facebook for iOS 5.1 is now available in the App Store. There were reports of bugs in version 5.1 earlier today but Facebook tells me they’ve been resolved. Update: This article originally stated that Facebook for iOS v5.1 didn’t have filters, and predicted they’d be coming soon. Turns out they’re actually already here.